By the age of 10, I'd visited Disney World in Orlando, Florida twice. Back then, I could rely on my parents to buy the Disney tickets, while I focused on enjoying the rides. These family vacations are amongst my earliest travel memories. What I didn't count on was my return to Orlando as an adult. The first occasion was in 1998, when I convinced a college friend of mine to join me for Spring Break in Daytona Beach, Florida. Being the bootstrapping college students that we were back then, the Greyhound bus was our preferred mode of transport. Twenty-four hours later, we arrived in Florida, and hit the beach. Daytona Beach may have been a hotspot in the 1980's, but we were about a decade too late. There were people, of course, but I wasn't seeing the action I was accustomed to on MTV. Luckily, we were close to Universal Studios, which we visited on a day trip from Daytona. There, we were able to go on rides tied to some of my favorite movies. The Jaws ride, while showing its age, was a must, but hardly scary. The Back to the Future ride involved getting in a mock DeLorean for a ride through space and time, only we didn't actually move anywhere. It was one of the most exciting rides I'd been on up to that point in my life. And the 3-D Terminator experience was cool too, and involved a surprise ending which shocked everyone in the theater. Thirteen years later, I returned to Universal Studios on another family vacation. With my parents living in Florida, we visited one day while I was home for Christmas last year. Universal Studios had expanded immensely since my college years. The park had doubled in size! Essentially, the park I visited in 1998 had the older rides, while a whole new area had opened featuring more modern movies and rides. The family split up. My parents went off on their own, while me and my brother went in our own direction. The first two rides we hit were Spiderman and Jurassic Park, the latter which involved getting ourselves soaking wet. 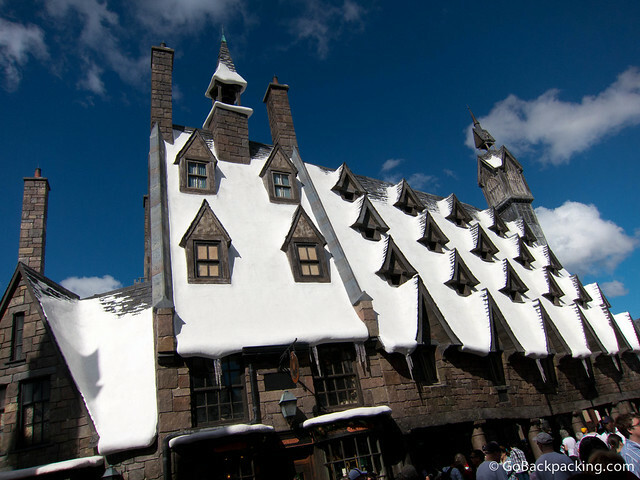 But the biggest attraction in the new Universal Studios is the Wizarding World of Harry Potter. My brother, having read all the books and seen all the movies, made sure we got our mugs of Butterbeer, and stood in the long line to get inside Ollivanders wand shop. I was along for the ride, and found it fascinating how my 32-year old brother, and so many other adults, were so captivated by the make-believe world of Harry Potter. For example, he spent $50 on a mock, plastic wand. And he was hardly alone in making such a purchase! At the end of the day, we reunited with my parents for dinner at one of their favorite theme restaurants, Jimmy Buffet's Cheeseburger in Paradise. It's my great hope that sooner, rather than later, I'll be back to Disney World and Universal Studios with my own family. I'll enjoy the same places through the eyes of my children, just as my parents had with me. And the whole cycle will begin anew. Disclaimer: This post was written by Dave, and brought to you by Attraction Tickets Direct. Great Post. I already have been to Disneyland and like you said – it’s a lot of fun for everyone. Also I think that children and families will profit most. If you really like the biggest rollercoasters, go to Bushgardens – it’s a beautiful “african-style” park with many animals and some really big rollercoasters!